This is a sponsored post written by me on behalf of Chalkworthy™. All opinions are mine alone. An antique, distressed paint finish is all the rage these days. A quick walk around any home decor store will prove this! However, the prices associated with a large piece of distressed furniture can be rather steep. 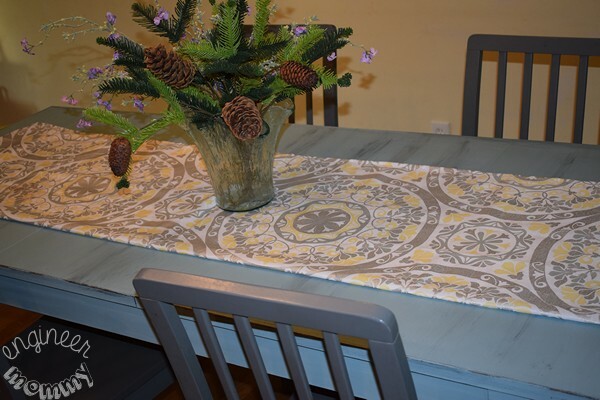 Did you know that you can achieve the same distressed look yourself with a Project Kit from Chalkworthy™? 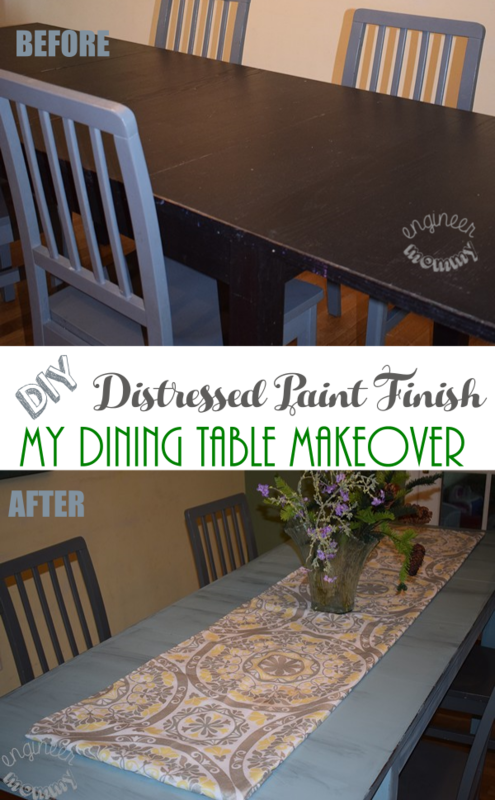 That’s how I completely transformed my dining room table, and I’m absolutely in love with the result! My dining table was purchased from IKEA several years ago. It’s still a sturdy piece of furniture and I love its big size, but the color and finish had seen better days. It’s a dark brown / black table and it had accumulated plenty of chips and scratches over the years! The Instructions that come with the kit are so useful! They really help the average DIYer figure out how to achieve any desired look. Want a Modern Look? Want a Multi-Tone Distressed Look? 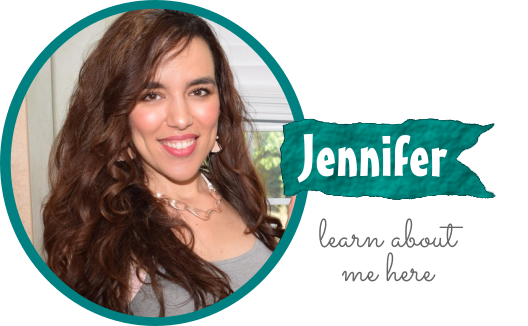 Want a Chippy Look? 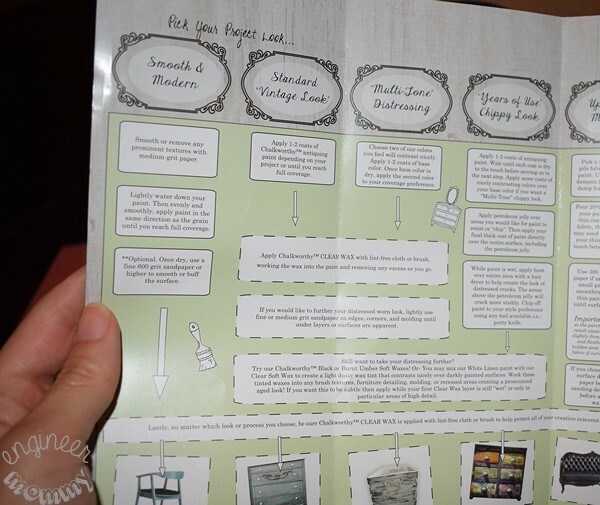 The flowchart makes it so easy to figure out how to create any of these popular finishes. 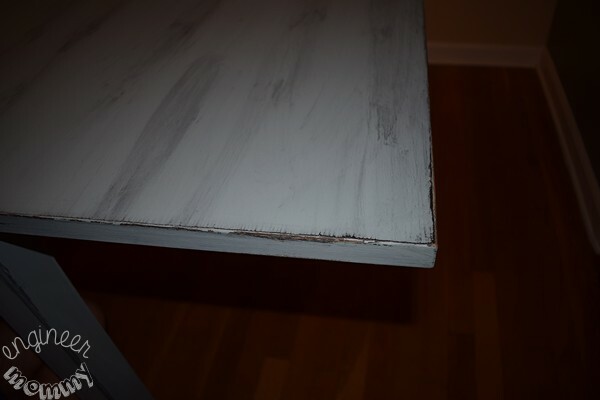 My goal was to create a Standard Vintage Look, so my first step was to sand down my dining table. 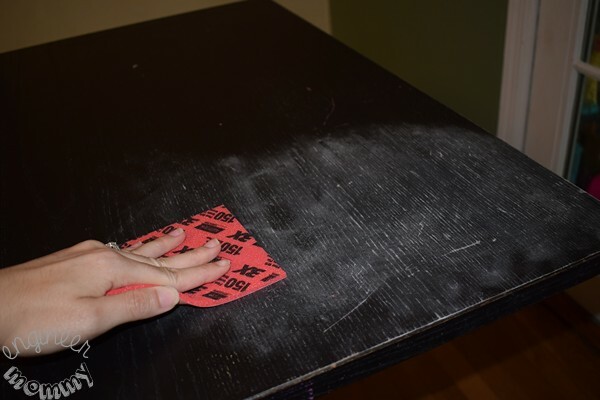 This step removed any gloss from the table and created the perfect surface for the paint to adhere. Also, this table was large and heavy- I didn’t want to move it outside or to the garage to complete this project. I simply placed some protective paper under each of the legs. I love a good simple solution! My first step was to add the Chalkworthy™ Antiquing Paint. Of course, as with any paint, stirring it beforehand is imperative to ensure a smooth, even consistency! 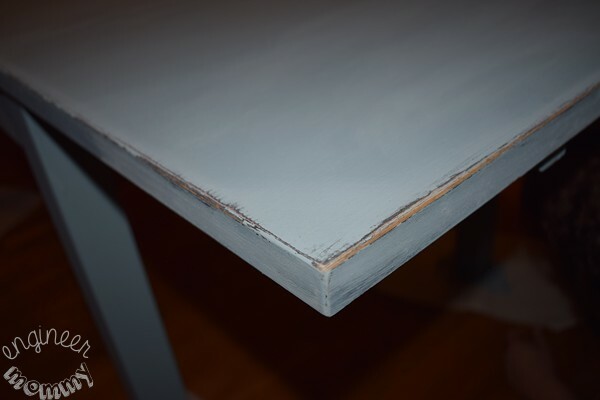 It was so nice to see this lovely light blue color (“DustyMiller”) being added to my dining table. 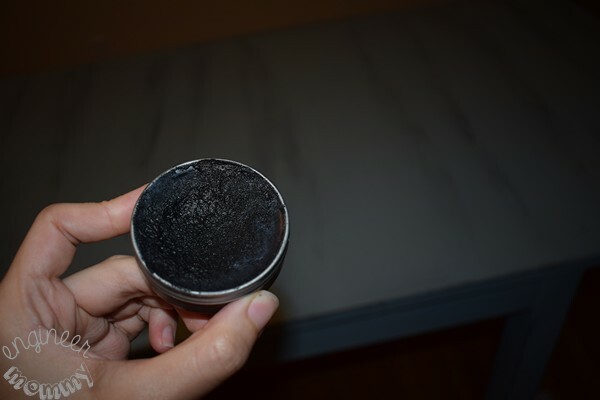 The texture of the paint is nice & thick and beautifully matte! By the way, with this paint, there is no need to prime or remove old wax or varnish. 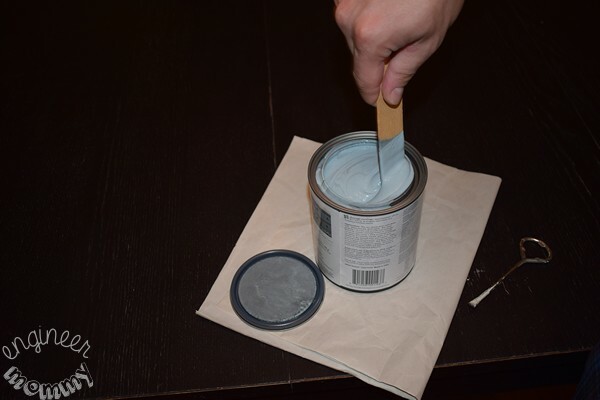 I really love that this paint is water-based and is low in odors & VOCs. 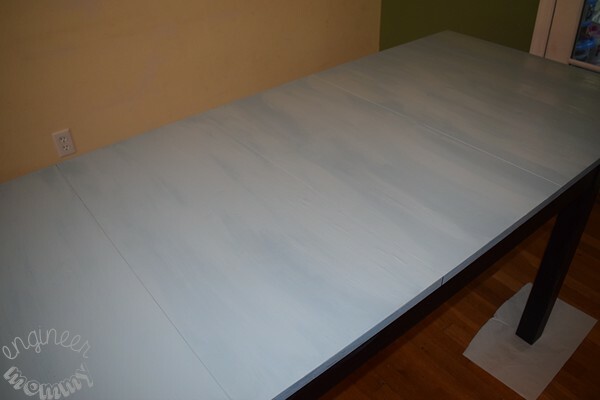 Here is the table after the whole top was painted. Keep in mind that this paint will adhere to most surfaces, including paint, brick, concrete, metal and even low-pile fabric. So the possibilities for DIY projects are really endless. I think my table is really starting to look better, right? To take the distressed look up a notch, the next step was to use the Chalkworthy™ Black Soft Wax. 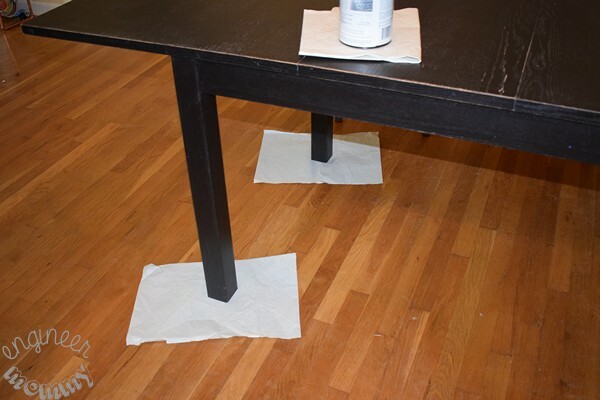 I applied the Black Wax randomly over the top of the table and along edges, corners, etc. Here is the effect of the black wax on the table! Isn’t it lovely?! I am absolutely in love with the finished look of my dining table. 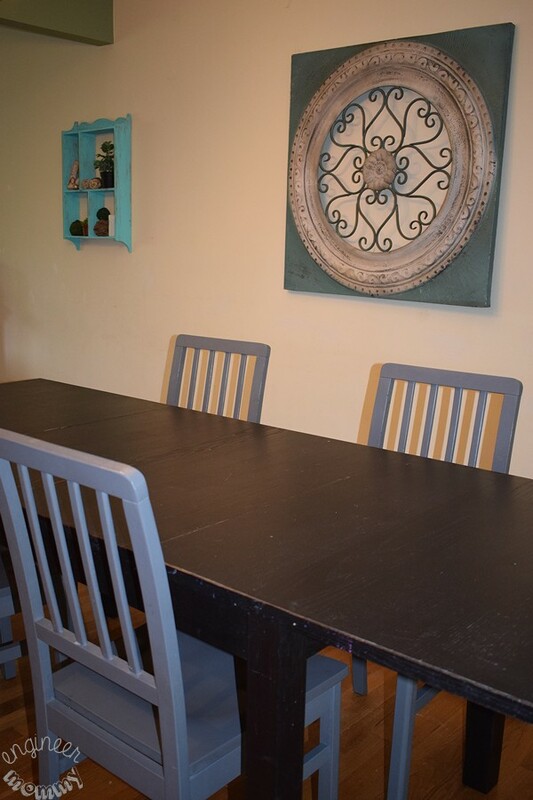 I think the soft matte blue color complements my dining room scheme beautifully! Every time I walk by the dining room, I have to stop and admire my work. A table that looks like this at the home decor store would easily run in the hundreds of dollars – I love that I DIYed this look for a fraction of the cost! 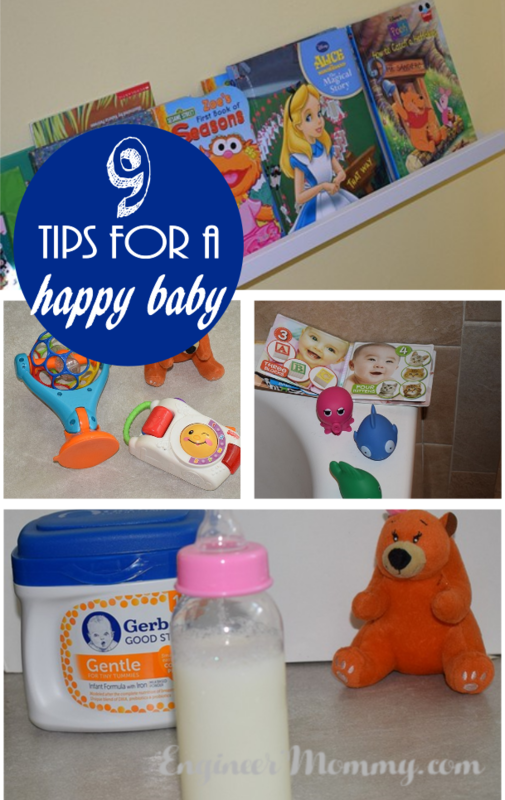 This is truly a project worth smiling about! 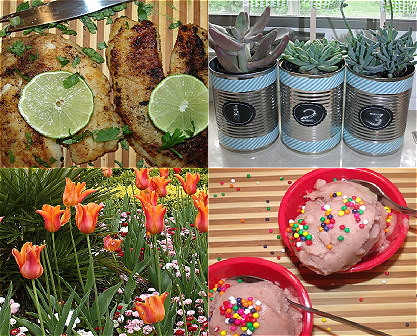 What DIY project is complete without a dramatic Before & After? Check out this fantastic transformation! 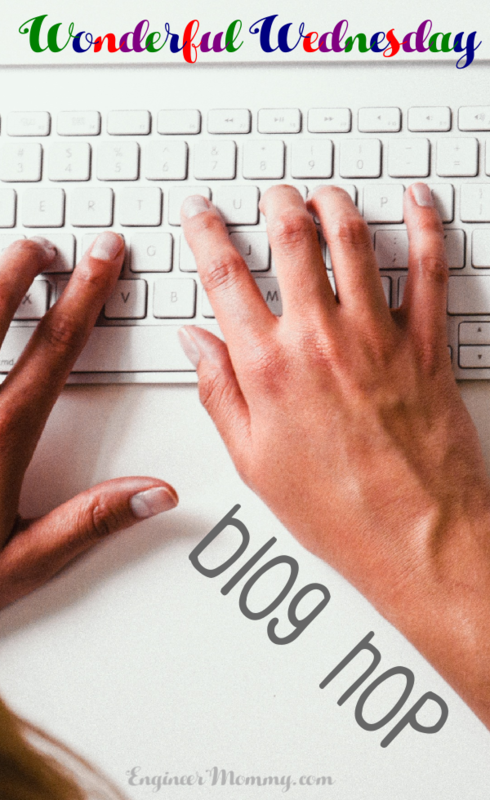 To keep up-to-date with the latest news & offers from Chalkworthy™, be sure to check them out on social media:Facebook, Twitter, Pinterest and Instagram. 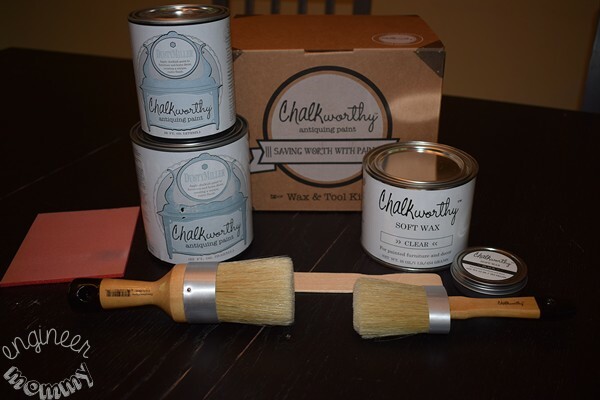 Now, learn more about how Chalkworthy™ paint can help you tackle those home decor projects and tell me: Have you ever used Chalkworthy™ paint? Which color would you choose for your home? 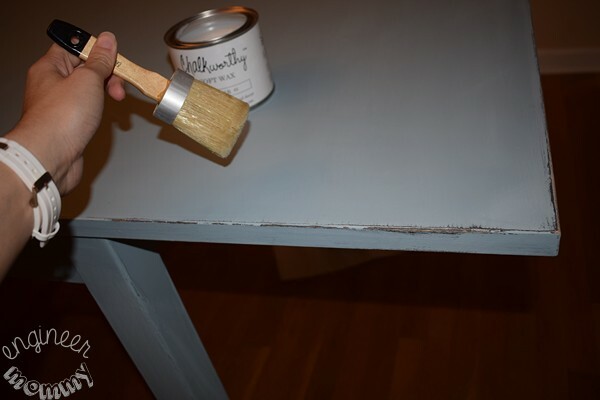 Are you also loving the distressed paint finish that’s so popular nowadays? I think it’s awesome that everything you need – including the sanding block – comes in the kit. The detailed instructions for the look you’re going for really comes in handy. I love the look and color of your table. You did a great job! Your dining table turned out to be so pretty. I wish I was as crafty as you. There are some stuff around my house that needs some beautifying.I’ll show this to my hubby. Maybe he can help me with it. Oh my goodness, I LOVE how your dinning table came out. First of all, that color is gorgeous. I love Distressed Paint so much. I love projects like this! Looks fabulous! I don’t have a table like this, but, would love to do this sort of thing and sell. okay now, can you come over and do mine!? 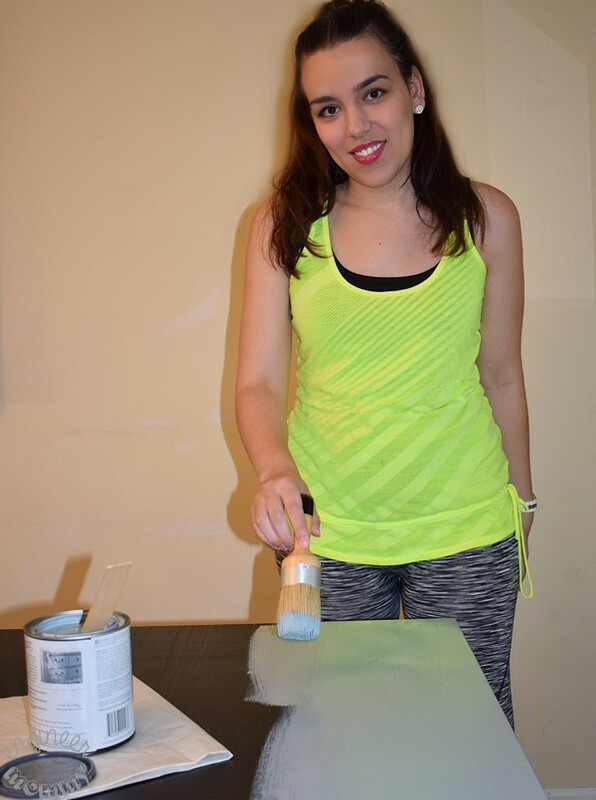 Seriously – I bought this paint application last year – I did one chair and gave up! SO MUCH WORK! I love this but am too busy and unfocused to settle in and just do it! It really was such a breeze to do! And to be honest, I had a lot of fun making over my table. I will definitely be ordering more paint to do more projects around the house. You really can’t beat the price of these project kits! Nice, your table turned out wonderful! I have always loved the looked of distressed furniture and wanted to take my hand at it but was scared I would mess it up, but after reading your post I am going to have to give it a try. I love the table! I’m always too worried to do things like this to my furniture, but it looks fantastic! I really need to try it. 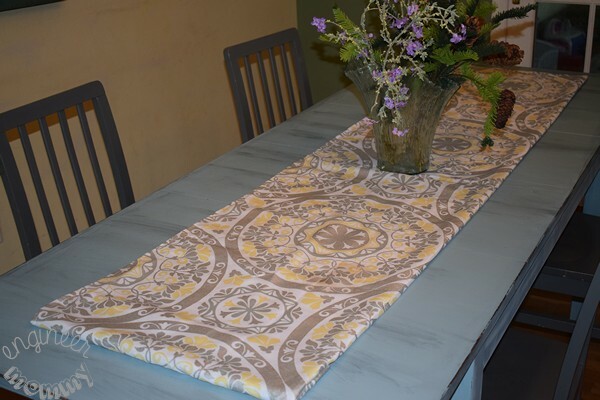 I love the look of this, and this tutorial makes distressed paint look easy. I will have to try it sometime for sure! I love how this turned out!! What a great way to change up your table. I really like the color you went with. You did a really good job using the sandpaper to achieve that look! Wow, that looks great! It would look perfect in a country French kitchen with all white cabinets – great job! Wow, you did a great job. It looks beautiful. I have always wanted to try something like this. I’m not very crafty, so I’m not feeling really confident. I love rustic design, it makes the house feel more warm and cozy, something to that effect. I think this is awesome! The color is a great choice as well. Now I know what to do with my ugly dining room table! This looks easy and is so gorgeous. What a difference it made in your table. I always loved the look of distressed wood, and this looks like something even I could do! Very pretty. Really cute and creative, this is a great way to bring new life to an old piece of furniture. Very affordable as well.